Bumper walk - and one of most picturesque! Registration is now open for the picturesque Wadsworth Boundary Walk challenge, which takes place on the final weekend of the month. 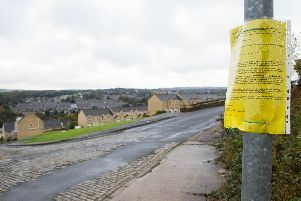 The walk has been organised by the Rotary Club of Hebden Bridge annually since 1999 and follows the scenic boundary of Wadsworth Parish above Hebden Bridge - the second largest parish in the country. This year’s event takes place on Sunday, May 31, taking in some of the most spectacular scenery in the South Pennines and, in walking terms, is described as moderately difficult. It is approximately 21 miles long and includes the beautiful wooded valleys of Hardcastle Crags and the commanding heights of moors above the Luddenden Valley. Runners are welcome to join in and run the course but the organisers ask them to check in and start their run as early as possible (registration opens at 8am). In Lindsay of the club said: “This year, to accommodate leisure ramblers and families, we are offering two options for walkers to choose from - the full 21 mile walk, with check points at nine miles and 16 miles, or a short, family friendly, four and a half mile walk through the beautiful wooded valley of Hardcastle Craggs. Details of the two options, with drinks available at each checkpoints, are: full walk (includes a packed lunch) - start at Mythlomroyd then up on to Midgley Moor, Luddenden Dean, Limers Gate to Keighley Road, Lumb Falls, Walshaw Dean reservoirs, Widdop, Hardcastle Crags and back to Hebden Bridge, and a walk along the canal bank back to Mytholmroyd; the short walk (without packed lunch) - transport is provided from Mythlomroyd to Widdop and walk down the beautiful Hardcastle Crags wooded valley to Mytholmroyd, via Hebden Bridge. In advance: Full route (all ages) £8. Short walk, adults £5, children (4-14), £3. On the day: Full route (all ages) £10. Short walk, adults £6, children (4-14), £4. The registration/start and finish has changed from last year and is now at Mytholmroyd Community Centre, Caldene Avenue, Mytholmroyd, which has plentiful car parking. For all relevant details and registration forms (with an on-line option available for the first time this year) see website www.hebdenbridgerotary.org.uk or www.facebook.com/wadsworthboundarywalk. You can also email hebdenbridgeboundarywalk@gmail.com with any comments or queries you may have.